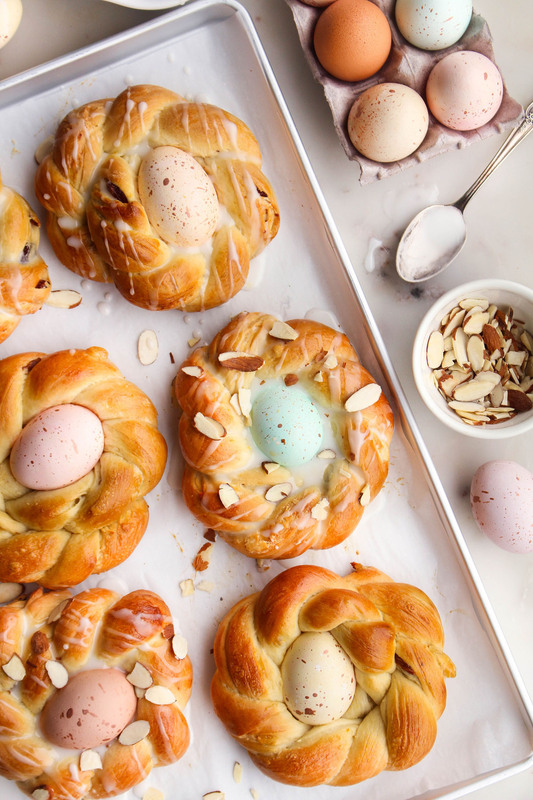 These fluffy, yeast breads are scented with fresh orange zest, studded with plump raisins and dried pineapple, drizzled with a sweet almond almond glaze, finished with a sprinkle of toasted almonds and a few festively dyed Easter eggs. Bread Machine Method: Have liquid ingredients at 80ºF and all others at room temperature. In bread machine pan add milk, eggs, butter (cut into very small pieces), flour, yeast, orange zest, sugar and salt to machine according to manufacturer's directions. Select dough/manual cycle. When cycle is done mixing, turn dough out onto a lightly floured surface. Knead in pineapple, raisins and almonds. Continue kneading, about 5-7 minutes, using additional flour (if necessary) to make dough easy to handle . Let rest 10 minutes. Continue with shaping directions below. Hand-Kneading Method: In large mixing bowl, combine 1 cup flour, yeast, orange zest, sugar and salt; mix well. In microwave-safe dish, warm milk and butter to 120-130°F (butter does not need to melt). Add milk mixture to flour mixture. Add eggs. Stir together until combined. Mix in enough of remaining flour, ½ cup at a time, to make a soft dough. Turn dough out onto lightly floured surface. Knead in pineapple, raisins and almonds. Continue kneading, about 5-7 minutes, using additional flour (if necessary) to make dough easy to handle . Let rest 10 minutes. Continue with shaping directions below. For mini Easter egg bread rings (nests): Punch down dough and turn out onto a clean, dry surface. Divide your dough into 12 equal pieces. Use your hands to gently roll & stretch each piece into about a 12-inch long rope. Place your nests onto parchment-lined baking sheets (3 per sheet) Cover with plastic wrap and allow to rise in a warm place for another 45 minutes. While dough is rising, preheat oven to 375°F. Once your nests are done rising, use a pastry brush to gently brush them with egg wash (beat egg, milk and sugar together). Finally gently press 1 whole uncooked dyed egg in the center of each nest; gently press down into the center of the nest. Bake for 15-20 minutes or until golden brown. Remove from oven and place on a cooling rack to cool. Once cooled, mix together your almond glaze (see instructions below) and drizzle over the nests. Sprinkle with toasted slivered almonds (optional). For large Easter egg bread ring: Punch down dough and turn out onto a clean, dry surface. Divide dough in half. Roll each piece into a 26-inch long rope and twist together. Transfer to greased or parchment-lined baking sheet. Bring ends together to form a ring, pinching ends to seal. Gently pull twisted ropes apart to tuck 6 whole uncooked eggs into openings, placing eggs evenly around ring. Cover and let rise for about 30 minutes or until doubled in size. While dough is rising, preheat oven to 375°F. Once ring is done rising, use a pastry brush to gently brush with egg wash (beat egg, milk and sugar together). Bake for 25 - 30 minutes or until done, covering with foil after 20 minutes to prevent excess browning. Carefully remove from baking sheet and cool on rack. Once cooled, mix together almond glaze (see instructions below) and drizzle over the ring. Sprinkle with toasted slivered almonds (optional). Glaze: In small bowl, combine all ingredients. Add more/less icing sugar to achieve desired consistency. Drizzle over ring(s). Photo and small nest shaping instructions courtesy of TheFeedFeed.com. *Bright colors work best, but you can personalize the eggs with your favorite colors/designs. 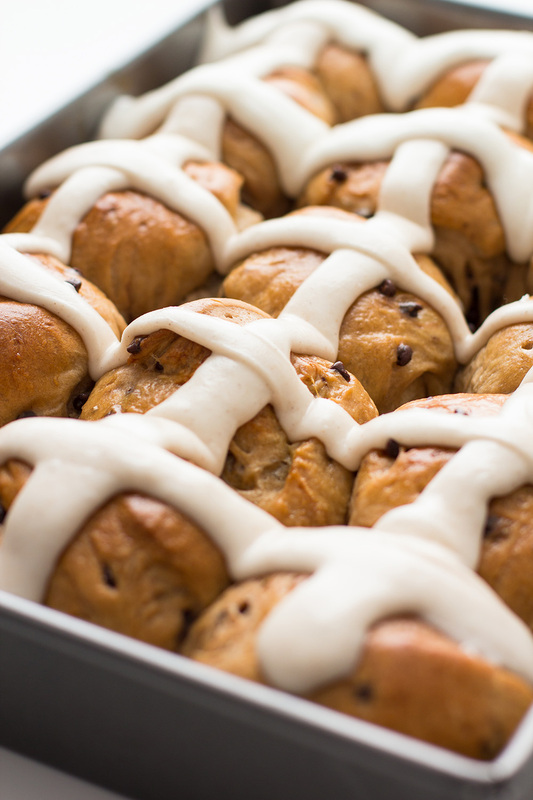 Be sure dyed eggs are completely dry before laying them on the dough.